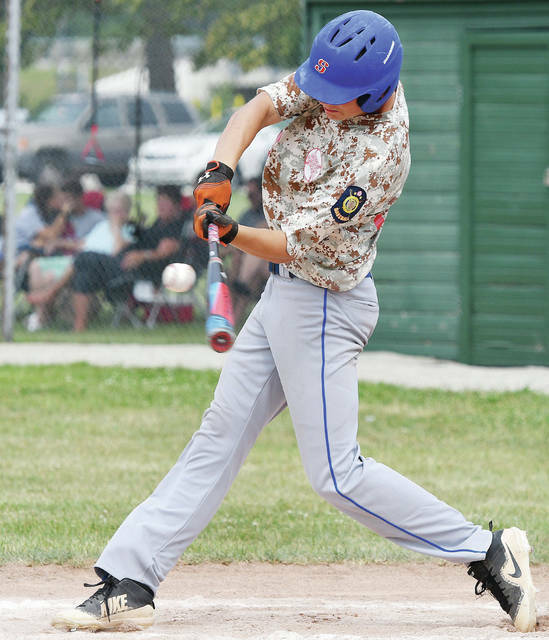 Sidney Post 217’s Dion Puthoff fields a hit during a Region 2 tournament game on Sunday at Custenborder Field. 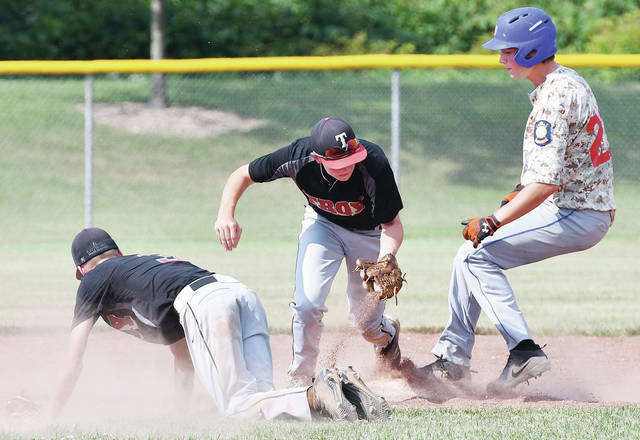 Troy Post 43’s Perry Casto, center, puts out Sidney Post 217’s Jack Heitbrink, right, at second as Troy’s Austin Kendall gets off the ground during a Region 2 tournament game on Sunday at Custenborder Field. Sidney Post 217’s Austin McClain turns around to try and tag Troy’s Austin Kendall at second base during a Region 2 tournament game on Sunday at Custenborder Field. 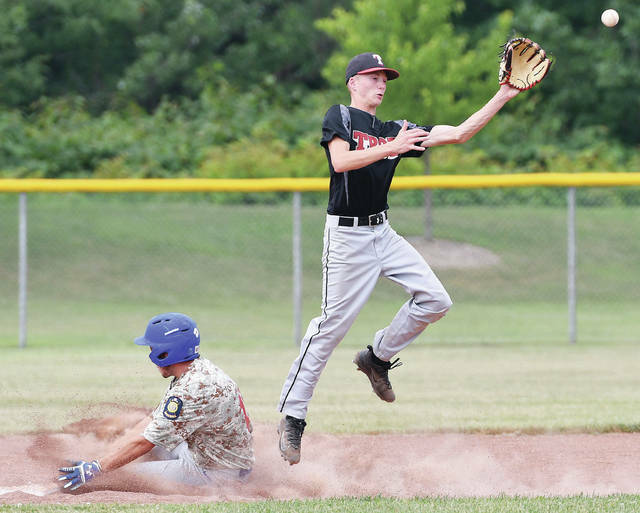 Sidney Post 217’s Austin McClain slides into second as Troy Post 43’s Austin Kendall jumps for a high throw during a Region 2 tournament game on Sunday at Custenborder Field. Sidney Post 217’s Kyle Noble waits for a throw from home as Troy’s Frank Gimuca dives back to first on a pick off attempt during a Region 2 tournament game on Sunday at Custenborder Field. Sidney Post 217’s Jack Heitbrink hits during a Region 2 tournament game against Troy Post 43 on Sunday at Custenborder Field. 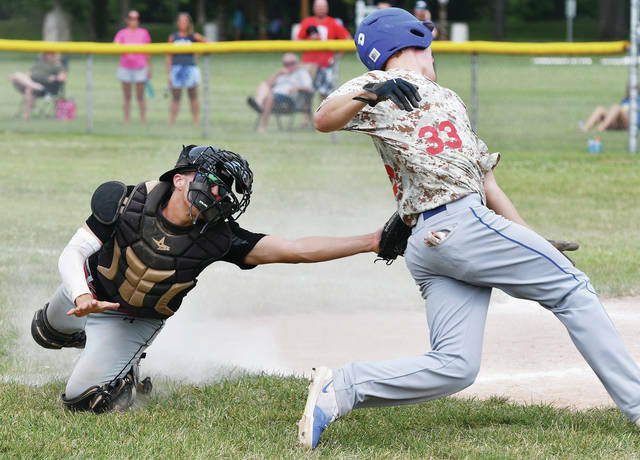 Troy’s Andy Wargo, left, tags out Sidney Post 217’s Dion Puthoff at home plate during the first inning of a Region 2 tournament game on Sunday at Custenborder Field. Puthoff was thrown out a home while trying to score after a double by Hunter Cohee. Sidney Post 217’s Cole Niekamp pitches during a Region 2 tournament game against Troy Post 43 on Sunday at Custenborder Field. Niekamp pitched a complete game shutout and allowed two hits. 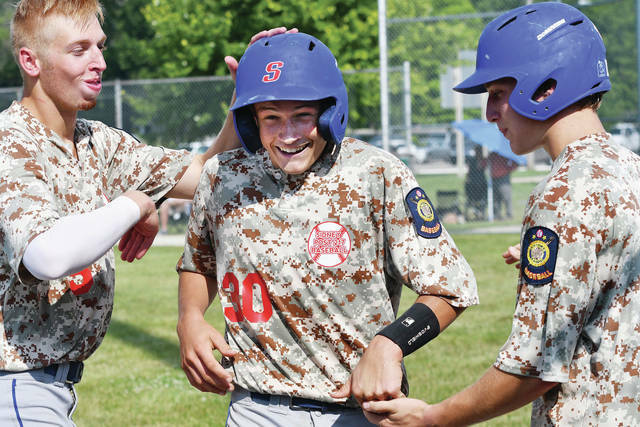 Sidney Post 217’s Darren Hoying, center, is greeted by teammates Hunter Cohee, left, and Dion Puthoff after scoring against Troy Post 43 during a Region 2 tournament game on Sunday at Custenborder Field. Hoying scored in the sixth inning to boost Sidney’s lead to 3-0. 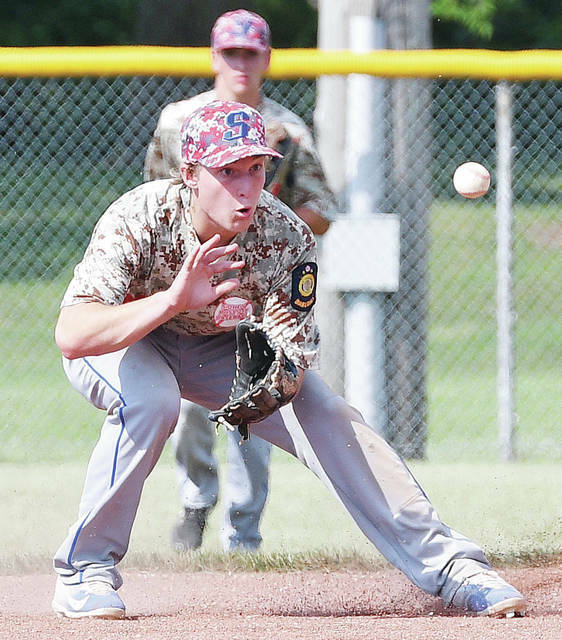 SIDNEY — A pitcher’s duel in an American Legion regional tournament game on Sunday at Custenborder Field came down to two late mistakes — both of which Sidney Post 217 benefited from. 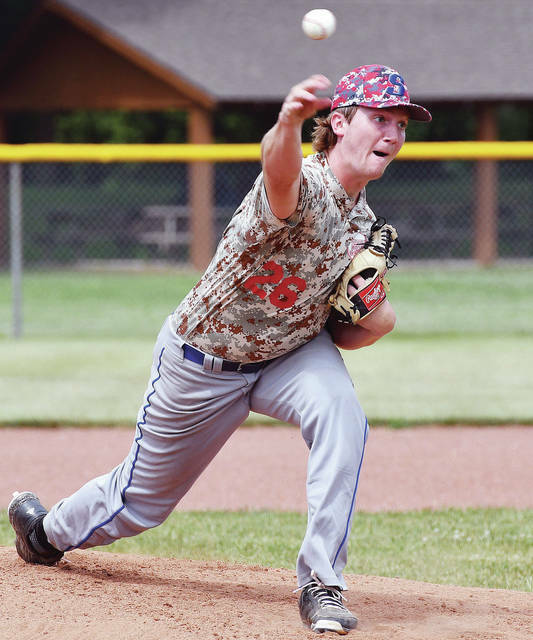 Leadoff hitter Austin McClain beat a throw to first to start a two-run inning in the fifth and Darren Hoying took advantage of a throwing error in the sixth to add a run and help Sidney beat Troy Post 43 3-0 in a Region 2 tournament game. Sidney (18-13) advances to face Van Wert Post 178 in a game in the winner’s bracket at 7:30 p.m. on Monday at Custenborder Field. With the loss, Troy Post 43 drops to the consolation bracket and will face Greenville Post 140 at 5 p.m. on Monday. McClain beat a bunt single off Troy pitcher Jacob Duncan to put runners on second and first in the fifth. After Dion Puthoff hit into a fielder’s choice and Hunter Cohee grounded out, Kyle Noble hit a one-run single to left field to put Post 217 up 1-0. Jack Heitbrink followed with a single that fell in front of Post 43 center fielder Noah Brown, who dove to try and make a catch. The single allowed McClain to score from third. Heitbrink fell behind 1-2 early, but Mosbarger gave him credit for fouling off a few pitches before hitting the single. It was a pitcher duel’s before Sidney’s big inning in the bottom of the fifth. Post 217 starter Cole Niekamp and Troy Post 43 starter Troy Powers allowed two hits apiece in the first 5 1/2. Powers was removed after walking Dapore to start the fifth, and Duncan allowed four hits over the last two innings. Hoying hit a one-out double in the sixth that bounced off the left-field fence after one hop. He then stole third and scored after a throwing error by Troy. Niekamp retired Post 43 in order in the seventh to finish a complete game. He allowed two hits in seven innings and struck out two with three walks and one hit batter. Troy’s best chance to score came in the second inning. Brandon Wilson led off the second with a double to left field, and after Duncan flied out, Austin Kendall drew a walk. Jacob Arthur then struck out, but Wilson and Duncan advanced to third and second on a balk. Perry Casto grounded out to end the inning. Wilson hit a single on a grounder to center field to lead off Troy in the fourth and later stole second, but the next three batters went down in order. Post 43 had one base runner the last three innings. Mosbarger credited Sidney’s infielders for solid play to help Niekamp keep the shutout. Post 217 will try for its third win this season over Van Wert (18-7). Sidney, which is the top seed in the tournament, rallied from an early deficit to beat Van Wert 3-2 on the road last Wednesday. 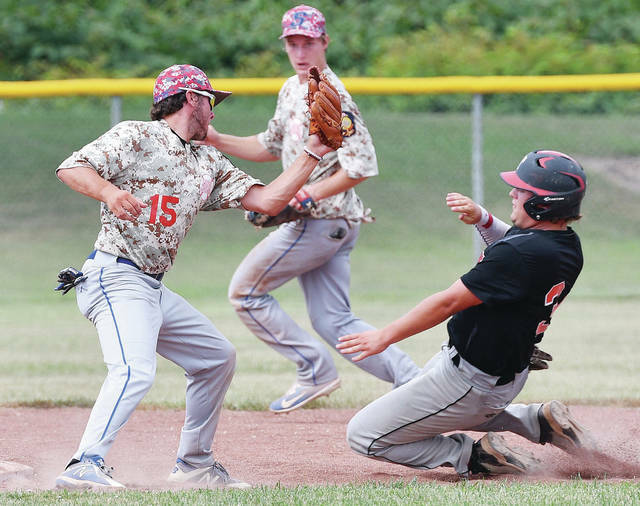 The win helped Post 217 claim the Western Ohio League title and earn the No. 1 seed. Van Wert, the region’s No. 2 seed, beat Greenville 13-6 on Saturday to advance to the game. If Sidney wins Monday, it won’t play again until Wednesday at 7 p.m. at Custenborder. A loss against Van Wert would drop Post 217 to the consolation bracket and put them in a game against the Troy/Greenville winner on Tuesday at 7. This entry was tagged American Legion, Austin Kendall, Austin McClain, Baseball, Brandon Wilson, Cole Niekamp, Custenborder Field, Darren Hoying, Daulton Mosbarger, Dion Puthoff, district, Frosty Brown, Hunter Cohee, Jack Heitbrink, Jacob Arthur, Jacob Duncan, Kyle Noble, Legion, Noah Brown, Perry Casto, pics, picture, pictures, Post 217, Post 43, Postseason, region 2, regional, score, Sidney, Sidney Post 217, Tournament, tourney, Troy, Troy Post 43, Troy Powers, Van Wert, Van Wert Post 178. Bookmark the permalink.